Tube after tube after tube of toothpaste. It was like a clown car. They just kept coming. And guess what–no floss was hiding in that drawer. How is it possible I had fifteen (15!) 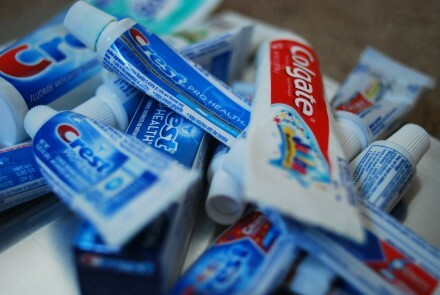 tubes of toothpaste and not one measly box of dental floss? It seems as though I write often about trying to fit writing into my life. I know some writers who say they do it because they can’t not write. That’s very fine for them, but I’ve discovered that’s not the way it happens for me. Yes, I can tell when I’ve spent time away from my writing, and yes, I miss it when I do. But I find it all too easy to be swallowed up in everything else in my life, so that my writing slips through the cracks. I’m a mother and I love it. I’ve got these four incredible and exasperating children I’m in charge of. If I’m not careful, their needs can completely overwhelm me to the point of doing nothing else. I brush my teeth every day. Without fail. Brushing is my first dental-health priority. I try to floss two or three times a week. Some weeks I’m better at consistently flossing than others. I feel good about my dental health; it would be worse if I didn’t floss at all, right? As a mother, I take care of my kids every day. Without fail. Motherhood is my first priority. I only write two or three times a week, like flossing. It’s recommended daily, but it would be worse if I didn’t do it at all, surely. Yet I still manage to beat myself up over what I’m not doing. Henceforth, I’m going to look at my life more like my dental health: do what you can, and don’t beat yourself up when you fall short of the ideal. Now I’ve got to go and buy some floss. Picture taken from Tami’s website, here. Once again, I’d like to welcome the fabulous Tami Carson to my blog. This time, I picked her brain about a subject near and dear to my heart (and stomach): Food. Wendy: So tell me about the food in Scotland. Tami: There is food available and food they eat. In other words, what you can buy in a store and what you find in restaurants. W: What? Food available is food from a store? W: Do they call it “edible” food? T: Oh, I see. No, those are my own special terms for food. W: Oh, okay. Slow brain. So what types of foods are available (in stores)? And what isn’t available that you miss? T: I miss rootbeer. I miss big bags of things like flour, sugar, brown sugar, chocolate chips, I miss Crisco, the kids mentioned kool aid the other day. T: Yes, hard to find big bags. Even Costco has smaller amounts. Or 5 small bags packaged together. There are some convenience things not here like microwave popcorn. I am pleasantly surprised by the selection of cereal, it’s plentiful and inexpensive. W: No microwave popcorn? My parents could never move to Scotland, then. They eat a bag of microwave popcorn every night before bed. W: You *can* make your own microwave popcorn, though. Since I imagine you didn’t take your popper due to the plug issue-thingy. 1/4 c popcorn in a paper bag (lunch size). Microwave for 2 minutes. Add butter. Voila! T: I will have to try it. First I will have to locate popcorn. I haven’t looked. T: Yes, the cinema has popcorn but it is very different! You can get sweet or salted. And neither have much butter either. The bags are much smaller. I like the salted one, it has a mild butter flavour. Mark [Tami’s husband] likes the sweet better but doesn’t love it. Healthier I am sure!! W: Interesting. Who knew popcorn differences could be so fascinating? T: I know right. And you adjust I think to the flavour. Theater popcorn in the States will be a shock! Baking supply aisles are sadly lacking. Tiny containers of cocoa powder, baking soda (which is bicarbonate of soda), baking powder, etc… And flavourings are different, can’t find maple extract. W: Yikes–and I think the cocoa powder containers HERE are too small! You can only make one or two things of brownies. Speaking of healthier . . . haha! Can you get maple syrup? 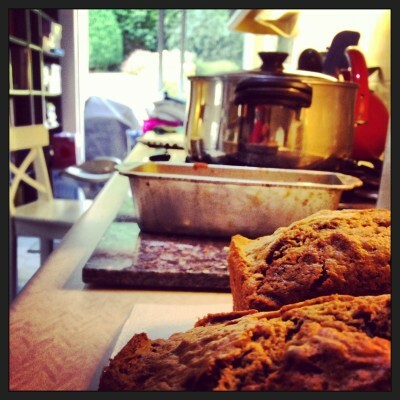 I saw the recipe for Cinnamon Quick Bread on your blog and wondered about that. Do they import their syrup from Canada or the US, or do they have places where they make maple syrup in the UK? T: They have maple syrup, pure maple syrup not Mrs. Butterworths or anything like that. Anywhere! The pure is expensive but a little less so than in the States. W: It’s definitely better for you than the fake kinds. T: And the containers are, again, small. We get the “big” jug at Costco and ration it and get two dinners of pancakes out of it. I want to bring back maple extract and start making our own. W: Phew. Zack [my 13-year-old son] would have a hard time. He’s syrup-ration challenged. T: So are my kids. And frankly, I don’t like dry pancakes. Again, we will get used to a more pure, less artificial taste in things. W: See, I don’t care for syrup, really. We’re all about melted butter and granulated sugar at my house. Well, except for Zack. Well, Eden, too. I guess it’s just me and the little kids who like melted butter with sugar on top. T: We may need to try that. A few of the kids have done butter and powdered sugar. “Confectioners” sugar that is. T: Yes they do!! And it was hard to find the first time. In general I think they use less preservatives. Thus smaller containers so that things don’t go bad. Less artificial colours and flavours. Lamb is more common in stores, both minced and chops. W: So . . . since I come from a sheep-herding lamb-eating family myself, how do you like it? T: Lamb is good. Still trying it out. I put it in something once and my family didn’t even notice it. At all! But I knew in my head it was lamb so it creeped me out. W: Hahaha! Have you tried haggis? Also . . . what is haggis exactly? T: I haven’t. Joe [her 13-year-old son] has. He gets it sometimes but I’ve never seen him finish. He gets it in a roll, like a sausage roll. I’ve heard rumours about the content but haven’t investigated yet. Sausage rolls are well loved in my family. An actual sausage (not ground) baked in a flaky croissant type roll. W: Sounds delicious! What do you use for Crisco since they don’t have it? Lard? T: Haggis is: lamb heart and lungs, cooked in spices with oatmeal then stuffed into the stomach lining of a sheep or ox. Like a sausage. W: Heart and lungs? Oh, dear. T: I know. I probably won’t try it. W: Sounds . . . tough. Chewy. T: It’s all minced and cooked down, so it’s a similar texture to sausage. I think, as we are here longer, we will learn more about how Scottish people eat. We eat our way still. I want to learn more about their habits and meals. Haggis is a good stopping place. We chatted more about food–quite a bit more, actually–so I’m going to break it up and post it later on this week. In the meantime, enjoy visions of sweet-ish cinema popcorn, abundant cereal, and haggis rolls in your heads! 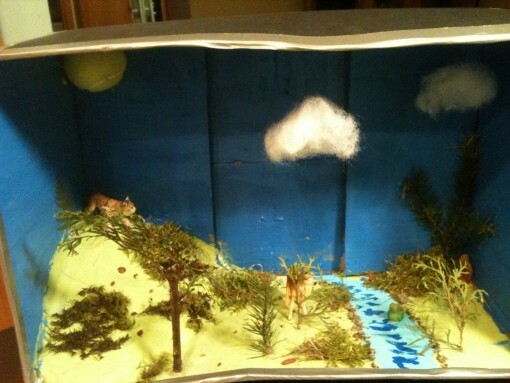 A diorama my son made in sixth grade. I took a class taught by Aprilynne Pike on world building back in February at the ANWA conference. I was asked to give a lesson on world building for my writing group, and I thought I’d adapt a few things I’ve come up with into a blog post. First of all: a synonym to “world building” is “setting.” All books have a setting. It is, in fact, one of the most basic elements in a story. I was fairly new to writing at this point, and that statement struck me as genius. I hadn’t ever heard that before—I hadn’t even considered it before. The setting as a character?! A whole galaxy of possibilities opened up. So I feel like setting is the first level, but when you take it to the next level, it puts you into world-building territory. (Although I did have a friend point out—you can change setting and still be in the same world. True.) And when you’ve built an amazing world to go along with your amazing story, that’s when your book will truly resonate and be memorable. In Aprilynne Pike’s class, she talked about her Wings series and how she has pages and pages of information just about the land of faerie—most of it not in the book. She had a whole history of the land, along with a monetary/bartering system, maps, and rules that govern the way the magic works. Even though all that information wasn’t part of the story, she attested it gave her work a depth, a realness, that wouldn’t have been there otherwise. She gave a couple of examples of other works during her class, where she read only small excerpts. Even though they were short, they still showed the type of world and set up how the setting became a character. Her first example was from Carrie Ryan’s The Forest of Hands and Teeth. Within the first few pages the world she has built is definitely a character in the story—a main character, from the looks of it. Another example she used was from The Giver by Lois Lowry. When I think of dystopian lit, it seems there are two types of worlds: ones where everything is in the hands of a controlling government and things are very, very bad (like The Hunger Games or 1984) and ones where everything is in the hands of a controlling government and things seem all right at first (Matched or The Alliance). I think The Giver falls into the latter category. Compared to a lot of other dystopian lit out there, The Giver starts out tamely. The world is a happy place and people are privileged to live there. And yet, there’s still this underlying wrongness about it. I started reading The Giver to my girls at the beginning of the summer, and when we got to the part where people were only allowed to raise two children (not their own), and the birth mothers were on the very bottom rung of society (after their “birthing years” were through, they were put in menial, hard labor jobs for the rest of their lives), my 9-year-old was completely horrified. So even though the language was “happy” and the people were “content” and the mother explains this to her daughter in a very matter-of-fact “this is the way it’s always been” way, Lois Lowry was able to strike these chords without really saying anything at all. There’s nothing overt in the book that says, “This is a crazy way to live.” She’s made the setting—the world—say that by simply being. Make your setting another character in your story. Use surprising details to pull the reader in—sight, smell, taste, touch, sound—and ensure the setting has a history as well as a future. Let it affect the mood and tone of the story you’re telling. Most of all: don’t forget to use it. Building a fascinating world where people want to go and see what goes on there is worth the extra time it will take you, as the writer, to weave into your book. Liz Adair has said, “I write cheap vacations.” So take your readers somewhere!